If you plan to attend Microgrid 2018, please be aware of an important upcoming registration deadline. Jan. 31 is the last day to take advantage of the early bird price for the May 7-9 conference in Chicago. That means if you register for the conference now, you can save up to $200 per person. We are also accepting speaker proposals through Wednesday, Jan. 31. After that date, the price jumps up, and the call-for-speakers ends. We urge you to act now. 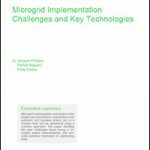 Our last conference, Microgrid 2017, held in Boston, sold out. To get an idea of the insight shared at that event, as well as some of the companies that attended, see our video interviews from the show. Sandeep Jain, who manages business development for Advisian, explains why Microgrid 2017 in Boston was a great opportunity for his company: He met potential customers he usually doesn’t get to meet at conferences, including municipalities, universities and hospitals. Read on for more on why you shouldn’t miss Microgrid 2018. The event will draw utilities, developers, energy infrastructure and technology companies, engineering firms, competitive retail suppliers, independent power producers, contractors, and others operating in the microgrid, energy storage and distributed energy arena. You’ll also gain insight from policymakers and regulators who are guiding the current microgrid landscape. Microgrid 2018 offers a chance to network with potential customers as well. Special sessions are planned for utilities, data centers, mission critical facilities and other microgrid customers. To register for Microgrid 2018, or to explore the event further, see here.